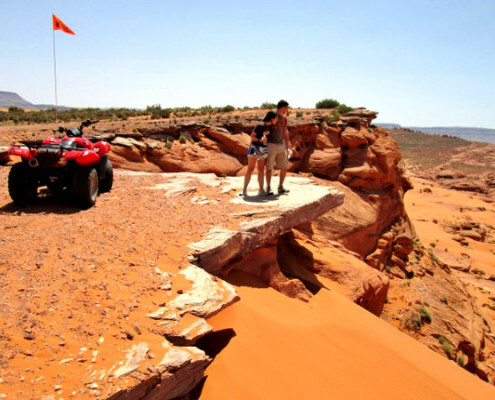 The Diving Board Rock UTV tour leaves right from our shop and gets you to the sand dunes and amazing views on a time crunch. The trails headed to the dunes provide a combination of trail types and different views. Most of the time you will see more on a two hour tour than a half day rental by yourself. The sand dunes provide awesome riding and with a tour guide to follow, you will be able to go on some pretty amazing dunes by following the guide’s paths. This tour typically has two stops at the best view points. One of the stops over looks beautiful Warner Valley. Tours are turn key meaning you only need to bring yourself and a camera/phone to take pictures with; we provide goggles, helmets, gloves, ice cold waters, and snacks! *note all tours are subject to change depending on the groups ability, the weather, the pace of the tour, and/or the guide. 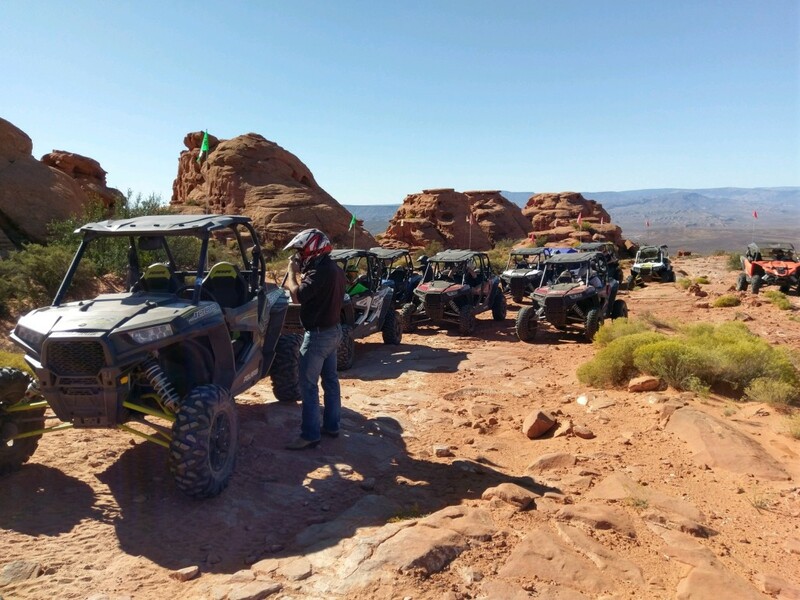 The Sand Mountain Mesa UTV tour is our most popular. This tour goes to the same riding areas as Diving Board Rock tour but includes either a rock climbing section or hill climb to a view depending on your tour guide. This tour also includes a stop at the famous Flintstone house, and more time blasting through the dunes than the Diving Board Rock tour. Tours are turn key meaning you only need to bring yourself and a camera/phone to take pictures with; we provide goggles, helmets, gloves, ice cold waters, and snacks! *note all tours are subject to change depending on the groups ability, the weather, the pace of the tour, and/or the guide. 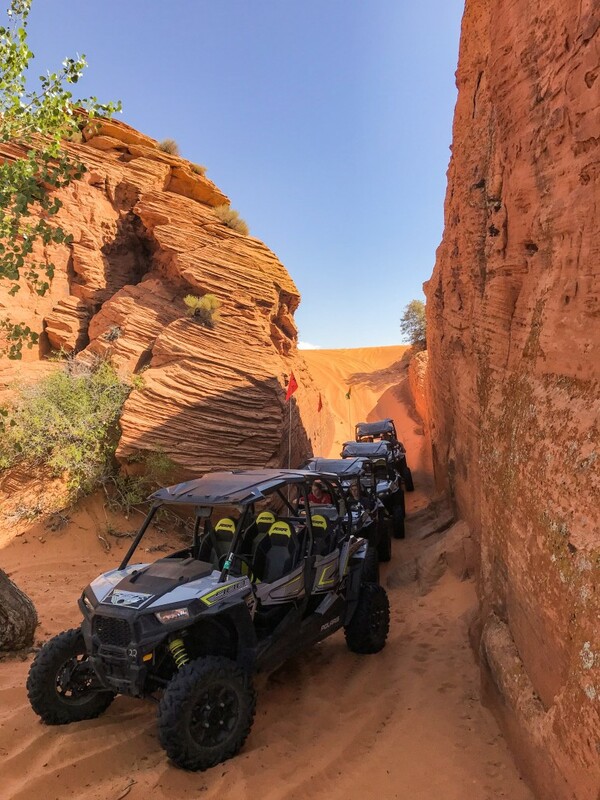 Our Warner Valley/Sand Mesa UTV tour goes out into the famous Warner Valley and makes several stops at the best slight seeing areas. These stops include, real dinosaur tracks, an old Mormon fort, and ancient Indian petroglyphs. After about two hours of Warner Valley the tour heads into a well defined wash that starts the climb to the sand dunes. Every minute of the tour is packed with awesome views with a wide variety of trails and of course fun riding. Tours are turn key meaning you only need to bring yourself and a camera/phone to take pictures with; we provide goggles, helmets, gloves, ice cold waters, and snacks! *note all tours are subject to change depending on the groups ability, the weather, the pace of the tour, and/or the guide.